If you are looking for love, look no further. Rusty is a pro at being loved and adored. 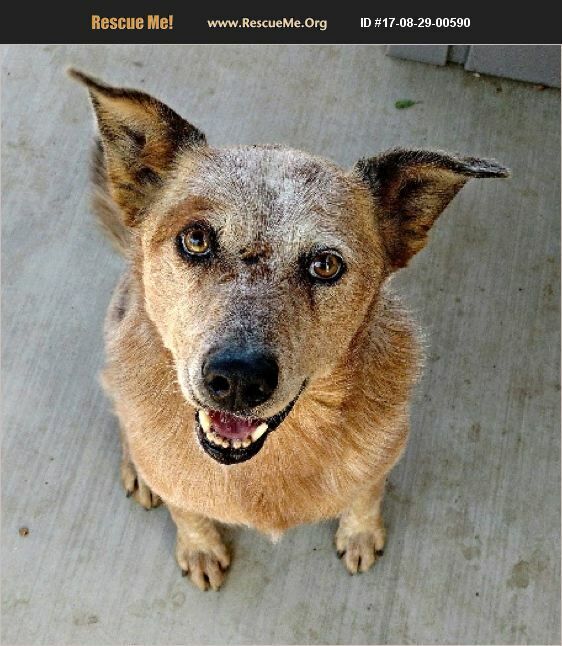 Rusty is a 9 year old Australian Cattledog. He weighs about 40 pounds. Rusty was left at a commercial property, apparently no longer wanted. Well, we changed that. We wanted him and we know that someone else will want him, too. He is such a wonderful boy he is hard to resist. Rusty know sit. His recall is pretty good, too. He is partly house trained, and can finish up the training quickly. He had lived outside in the first part of his life but is learning more and more what it is like to be loved. Rusty is good with men, women, and kids. He used to live with a dog his size and a chihuahua. A polite introduction can confirm whether a new pal is going to be his friend. Rusty knows about the leash. He is excited to go places, so he pulls. He also rides politely in the car. He needs a bit of coaxing to load. With repetition, he will keep getting better. After all, he enjoys going places with his person. Mostly, Rusty is a gem. He is a happy, dancing boy. He loves people and appreciates when someone stops to give him attention. Rusty is neutered, microchipped, and up to date on vaccinations. He is ready for a wonderful home in So Cal. A home visit and vet reference are required.